A visit to Charlecote Park for an afternoon visit to this National Trust property in Warwickshire. Near Stratford-upon-Avon. A deer park with a country house in the middle of it. Charlecote Park (grid reference SP263564) is a grand 16th-century country house, surrounded by its own deer park, on the banks of the River Avon near Wellesbourne, about 4 miles (6 km) east of Stratford-upon-Avon and 5.5 miles (9 km) south of Warwick, Warwickshire, England. 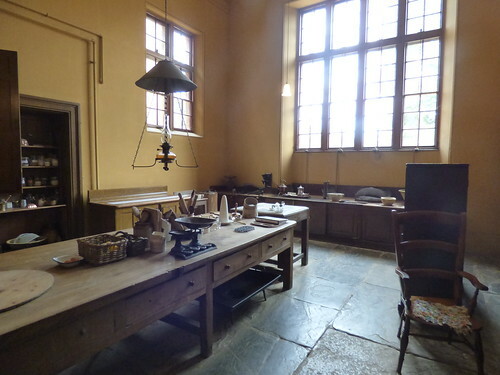 It has been administered by the National Trust since 1946 and is open to the public. It is a Grade I listed building. The Lucy family owned the land since 1247. Charlecote Park was built in 1558 by Sir Thomas Lucy, and Queen Elizabeth I stayed in the room that is now the drawing room. Although the general outline of the Elizabethan house remains, nowadays it is in fact mostly Victorian. Successive generations of the Lucy family had modified Charlecote Park over the centuries, but in 1823, George Hammond Lucy (High Sheriff of Warwickshire in 1831) inherited the house and set about recreating the house in its original style. Charlecote Park covers 185 acres (75 ha), backing on to the River Avon. William Shakespeare has been alleged to have poached rabbits and deer in the park as a young man and been brought before magistrates as a result. From 1605 to 1640 the house was organised by Sir Thomas Lucy. He had twelve children with Lady Alice Lucy who ran the house after he died. She was known for her piety and distributing alms to the poor each Christmas. Her eldest three sons inherited the house in turn and it then fell to her grandchild Sir Davenport Lucy. In the Tudor great hall, the 1680 painting Charlecote Park by Sir Godfrey Kneller, is said to be one of the earliest depictions of a black presence in the West Midlands (excluding Roman legionnaires). The painting, of Captain Thomas Lucy, shows a black boy in the background dressed in a blue livery coat and red stockings and wearing a gleaming, metal collar around his neck. The National Trust's Charlecote brochure describes the boy as a "black page boy". In 1735 a black child called Philip Lucy was baptised at Charlecote. The lands immediately adjoining the house were further landscaped by Capability Brown in about 1760. This resulted in Charlecote becoming a hostelry destination for notable tourists to Stratford from the late 17th to mid-18th century, including Washington Irving (1818), Sir Walter Scott (1828) and Nathaniel Hawthorn (c 1850). Charlecote was inherited in 1823 by George Hammond Lucy (d 1845), who married Mary Elizabeth Williams of Bodelwyddan Castle, from who's extensive diaries the current "behind the scenes of Victorian Charlecote" are based upon. GH Lucy's second son Henry inherited the estate from his elder brother in 1847. After the deaths of both Mary Elizabeth and Henry in 1890, the house was rented out by Henry's eldest daughter and heiress, Ada Christina (d 1943). She had married Sir Henry Ramsay-Fairfax, (d 1944), a line of the Fairfax Baronets, who on marriage assumed the name Fairfax-Lucy. From this point onwards, the family began selling off parts of the outlying estate to fund their extensive lifestyle, and post-World War II in 1946, Sir Montgomerie Fairfax-Lucy, who had inherited the residual estate from his mother Ada, presented Charlecote to the National Trust in-lieu of death duties. Sir Montgomerie was succeeded in 1965 by his brother, Sir Brian, whose wife, Lady Alice, researched the history of Charlecote, and assisted the National Trust with the restoration of the house. Formerly known as: Charlecote Hall. John Gibson. For George and Mary Elizabeth Lucy. octagonal ashlar shafts and caps. sections of strapwork balustrading between gables; quoins. original diapered brick to returns. ovolo-mullioned windows with leaded glazing. diaper brickwork and stair window with strapwork apron. reconstructed diaper brickwork to left. entrance with enriched key block over studded plank door. Arms impaling Williams Arms (for Mary Elizabeth Lucy). windows to each turret, one to each floor. East side has 3-window range with recessed range to right. fire-dogs; white and pink marble floor, Italian, 1845.
bearings; painted arabesques to shutter backs. ceiling, and large pier glasses. fireplace with Chinoiserie panel; 1950s stair to attic. scenes painted on canvas, male and female grisaille busts. with latticed chamber for smoked meats over door. to spiral timber turret staircase. Other rooms with similar fireplaces and coloured glazed tiles. The house on this side houses the Victorian Kitchen, Servant's Hall Shop and Charlecote Pantry.